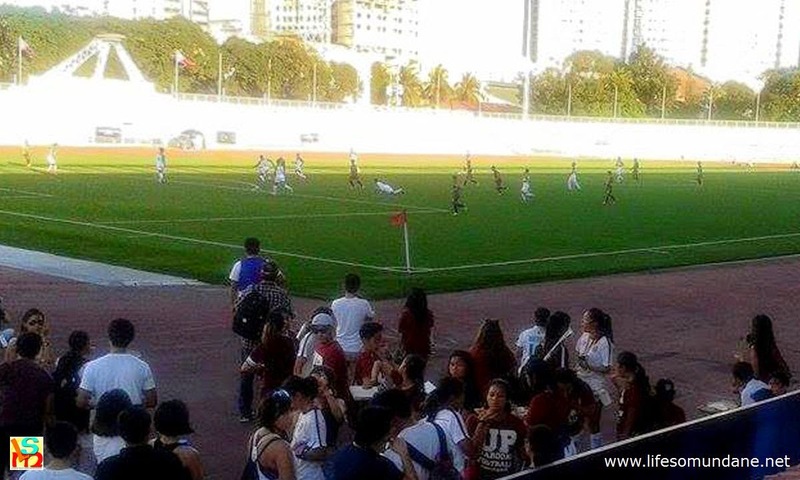 The UAAP football finals were played at the Rizal Memorial Stadium on 8 March 2015. 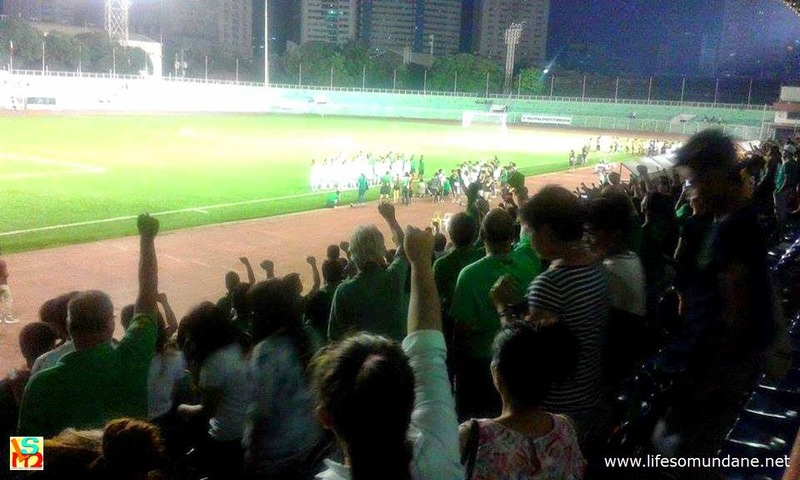 Perhaps, on the balance of play, it can be said that Far Eastern University deserved their 3-2 extra time win over De La Salle University in the final of the UAAP men’s football tournament yesterday at the Rizal Memorial Stadium. Even before Paolo Bugas’ speculative shot was deflected in for the winning goal four minutes into extra time, FEU had a clear shout for a penalty denied; and had it been awarded, the game could have been settled in regulation time. That said, the Green Archers, after a cagey opening half when the clearest chance of note was a freekick thumped against the post, did take the lead twice in the second half. Both DLSU goals were compilation material. 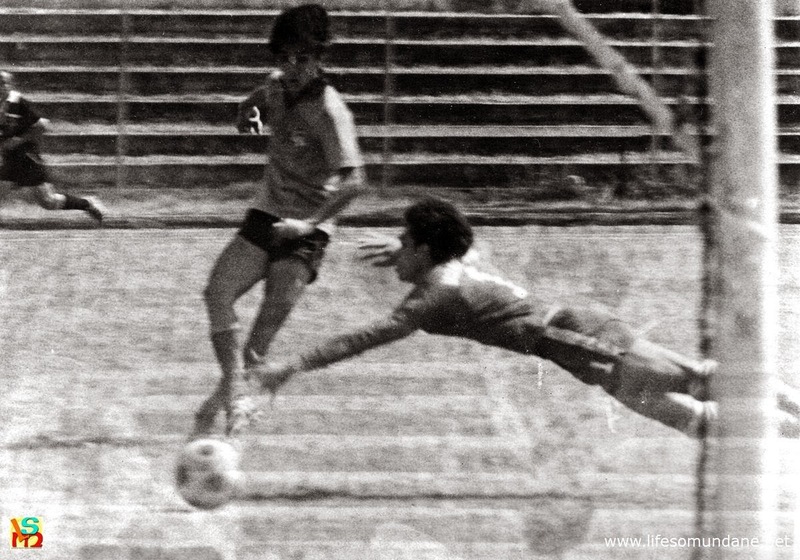 The first was a 58th minute Gio Diamante cannonball through a sea of defenders. The second was route one football, scored in the 81st minute with a cheeky lob from 30 yards by Sabin Bustamante. The Rizal Memorial was a lonely place to play football in back in the late seventies. The Archers, perhaps, were a tad guilty of switching off on the two occasions when FEU equalised, the first in the 72nd minute through Eric Giganto and the second in the 83rd minute through Jhan Jhan Melliza. Perhaps, too, the Archers could have been better served by closing shop after having gone ahead with a mere nine minutes left of regulation time to play. Because I played varsity football for DLSU back in the late seventies, I was firmly behind the Archers and was disappointed that the evening could not be capped with a championship trophy. In perspective, however, it is hard to feel embittered by the loss when – loyalties aside – football in this country was so obviously the winner. 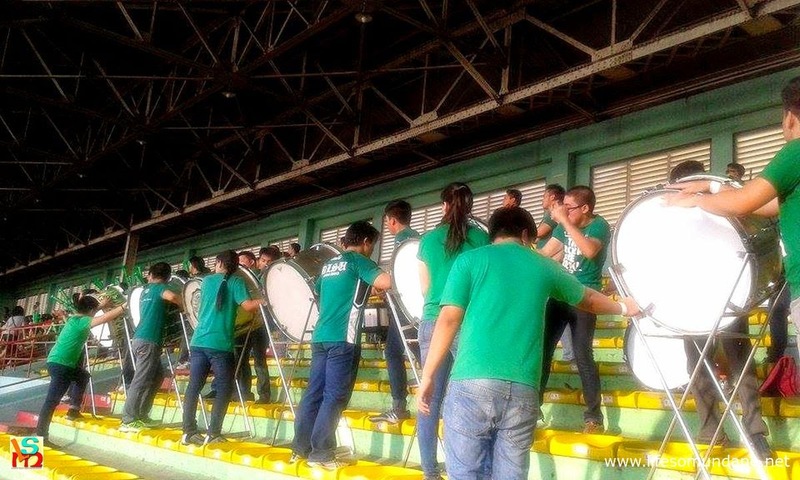 The DLSU Pep Squad with their drums and all. Fantasy stuff back in the late seventies. Hail to the alma mater! The Rizal Memorial is a lonely old place to play a football game in when the stands are empty; and I know the feeling from personal experience because I used to play there for DLSU during the university’s NCAA days. Yesterday’s final was a long way from being a sell-out, but the attendance was still massive by college football standards. 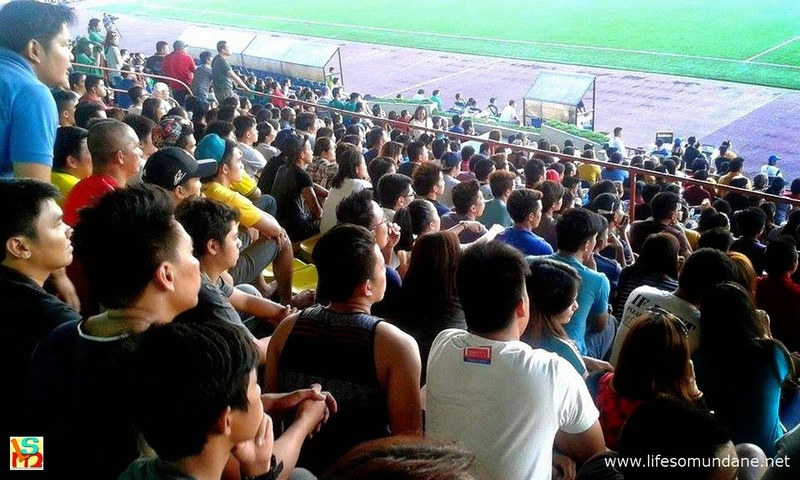 The grandstand was packed; and in the second half a hundred or so trickled into the bleachers section. Moreover, DLSU’s Pep Squad was present. I used to envy all the attention the basketball team got during my day; even as I had to grudgingly admit that the pep squad would have been an irrelevance in our matches because the stray cats that came to the stadium obviously could not cheer and were also unaffiliated. FEU arrived at the final also well supported. 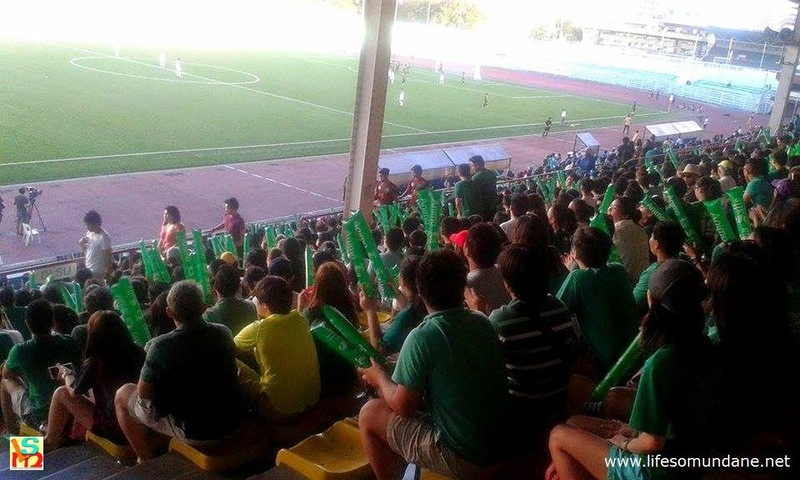 The DLSU side, complete with clappers. Yesterday, both teams’ sets of supporters not only came clad in the school colours; they also made a boisterous, participative crowd. Cheers of “D-L-S-U Animo La Salle!” and the totally unimaginative “FEU! 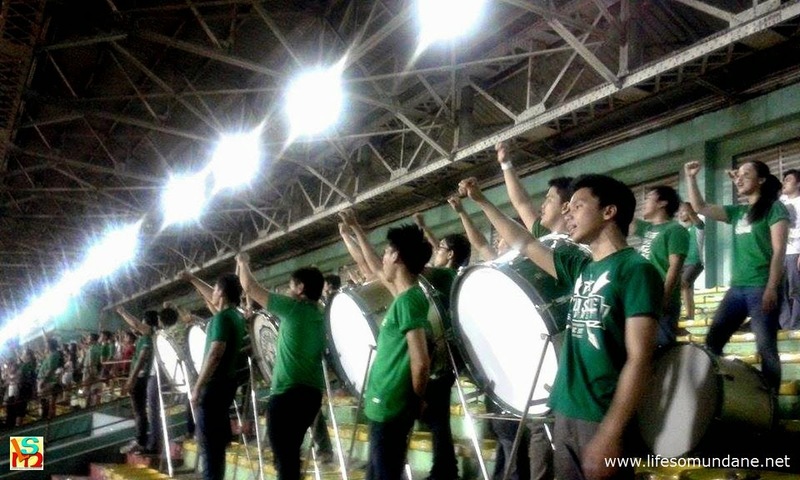 FEU!” reverberated around the stadium and gave the final a proper atmosphere. 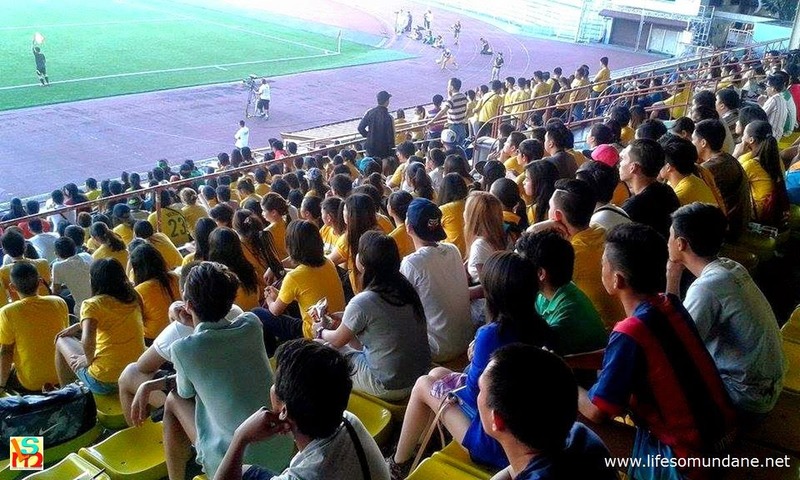 I played Sunday football with my club yesterday so could not be at the Rizal Memorial to watch. But at home in front of the telly, I was drooling. The match was not only broadcast live to a national audience but was also available by live stream to anybody who cared to watch around the world. Why could this not have happened three decades earlier? It was the sort of thing that I used to dream about back in my day; albeit, every football player during my time knew deep in our guts that dreams our football fantasies would remain. Bill and Ted know a crowd like this was not possible in the late seventies. For the Green Archers, the loss notwithstanding, it was a privilege to have played that game. I can fully understand the despair and frustration that the Green Archers felt after the referee blew the final whistle to end the match yesterday. Cheer up lads, though! If you were to hop into Bill and Ted’s telephone booth and go on an excellent adventure back to the same venue in the late seventies, you will quickly realise what a privilege it was for each of you just to have been there playing yesterday. The result was almost irrelevant. Football was the winner. Acknowledgment: Photos by Daren Dimaunahan.